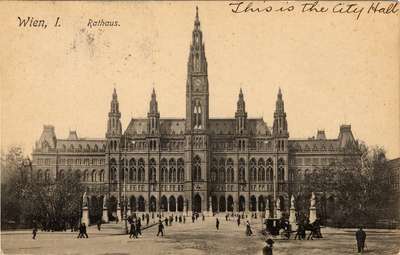 A postcard of Vienna's City Hall sent from 25-year-old Agnes Mary Kitchen to Rev. R. B. Layton in San Fernando, Trinidad, B.W.I. Vienna's City Hall was erected between 1872 and 1883 in the Gothic style. We leave here tomorrow. Are due at the Passion Play on Wednesday. Had a splendid guide through Italy. Engaged him for Rome and found him so satisfactory we took him all through Italy.